It's the first Monday of February, which means it's time for another entry in the speculative fiction tropes series. This month, we're delving into that which is beyond us, as we discuss the Eldritch. People have always held a certain fascination with the old things that came before, especially those that might still be hanging around. It's only natural that this interest bleeds into the stories we tell, where our imagination is the only limit to the strange and wonderful ideas we can explore. And of course, some of them have been a little . . . well, dark. Such is the eldritch, inconceivable beings and creatures (if they can even be described as such) whose scope of power and mere existence is beyond mortal comprehension. Simply witnessing the alien majesty of these Old Things may be enough to drive the minds of men toward blithering insanity. Their very presence warps the fabric of the reality we think we understand. Like most of these tropes (I sound like a broken record at this point) eldritch creatures abound in some of the oldest stories known to man. The various folklore and mythologies of the world are chock-full of them. 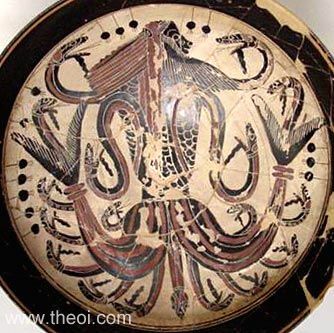 Ancient Greeks spoke of Typhon, the last son of Gaia, who was known in Greek mythology as "the father of all monsters." Descriptions of him vary, but in one text or another he is said to have a hundred dragon heads with eyes of fire, a body draped in wings, and legs made of viper coils. As tall as the stars themselves, he was feared by all of the gods but Zeus, who he defeated in their first battle. 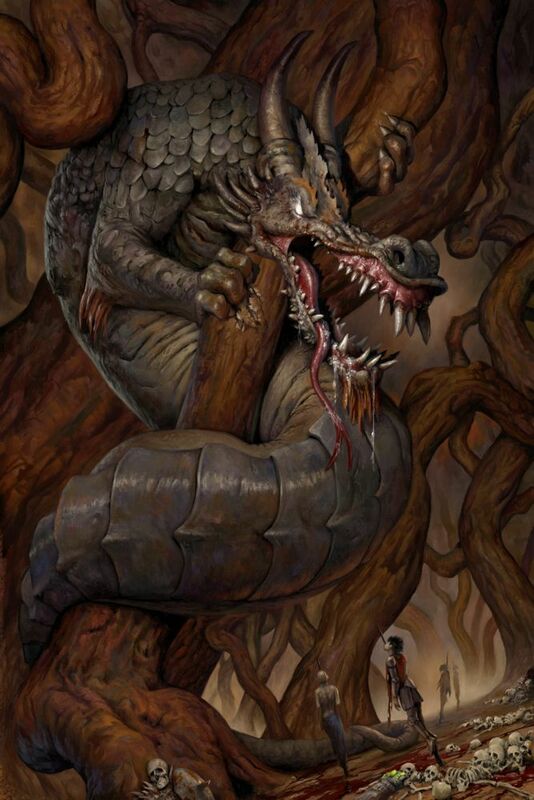 Norse mythology has Níðhöggr, a titanic dragon that gnaws at the roots of the World Tree between meals, which consist mainly of human corpses. To give you an idea of his size, our world is said to rest at the end of one small branch of Yggdrasil, which he lives beneath. He is described as so immense and powerful that the Ragnarök itself will not destroy him. Even the Judeo-Christian texts of the bible describe great creatures like the sea-dwelling Leviathan and the elephantine Behemoth. These monstrous animals were cited as examples to Job to demonstrate the futility of questioning God, who alone created these terrible creatures, and who alone could tame them. We won't even go into the Lovecraftian beasts of Revelation—we'd be here all day. Speaking of H.P. Lovecraft, this entry would be a big fat fail without him. Lovecraft literally wrote the book on eldritch terror. His tales of cosmic horror describe a reality teeming with otherworldly undercurrents, even the smallest glimpse of which can destroy the psyche of the unwittingly curious. Most of the eldritch creatures in his works were literal aliens, though often worshiped as gods by those who stumbled upon whispers of their existence. 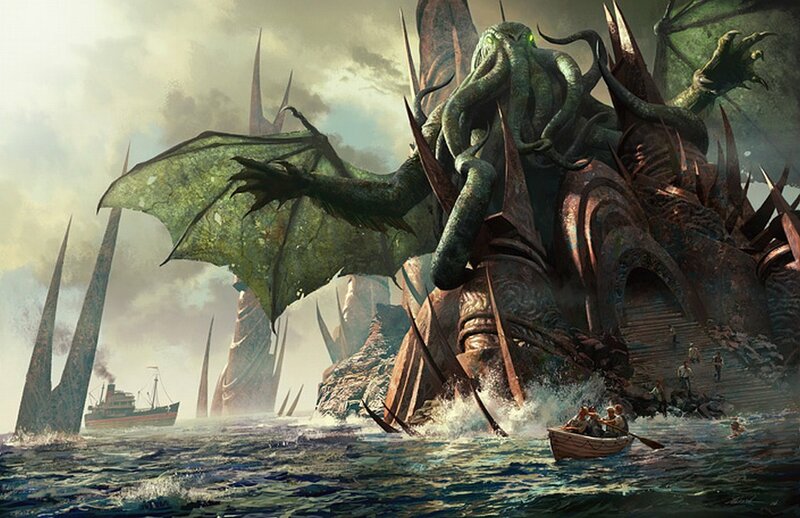 The most famous of these Great Old Ones is undoubtedly Cthulhu, who has become a strange cultural icon in recent years, mainly among übernerden like myself. Cthulhu patiently dreams at the bottom of the South Pacific, awaiting the conditions for his return. Though I've never considered myself much of a horror writer, Lovecraft is definitely a big influence on me, and I've flirted with the eldritch a time or two in my own work. One of the unpublished stories I'm shopping around now delves pretty deep into Lovecraftian territory, though to reveal exactly how and why would be giving too much away. Hopefully it will see publication one day soon, and won't drive any of you too mad when you get a glimpse of it. My first published story, A Giant Mess of Darkness, also flirts with eldritch concepts, though it's left to the reader to decide whether the Old One in this story is the cause of madness or the product. These kinds of stories are the perfect meeting place of the horror fan and science fiction nerd within me, and I love the idea that there might exist a form of cosmic life out there so great and terrible, so alien and incomprehensible, that just catching a glance of it would rend your mind like a meat grinder. The fear of the unknown is a powerful human instinct, and when done well, this kind of fiction plays that facet of the ego like a drum. 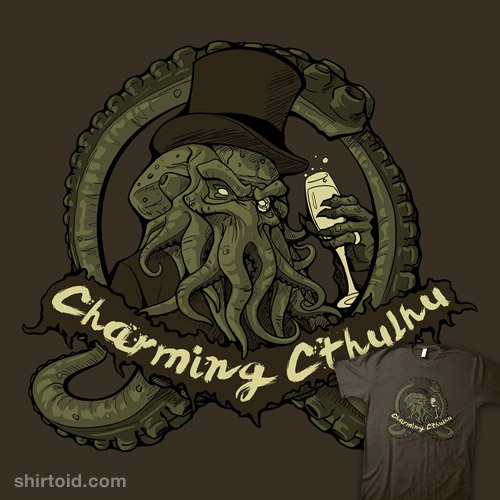 As a reader, I can't get enough of it, no matter how cute and cuddly Cthulhu becomes over the years. I agree, Vero. The best horror stories are those which delve into the alien unknown. Why bother with concepts of the supernatural when there might already be forms of life out there far beyond what we consider natural? I agree though, the creatures of Beowulf are fantastic, and it's one of the oldest written stories known to man! Thanks for stopping by. I discovered I share a birthday with H.P. Lovecraft. My friends said, "That explains so much!" And then there was much rejoicing, aka heckling and Facebook pun wars, because that's how we roll. I agree, the concept of the eldritch is endlessly fascinating to me. We humans tend to carry around a measure of arrogance with us, trying to fit the universe into our scope of comprehension. There may be things out there that would break us just to know it is. Thanks for the comment, Rebekkah! Have to include Lovecraft! He created a whole mythos of beings like that. Yes, indeed! Thanks for reading, Alex. I had no idea this is what they were called! I had a very high tech name for them: creatures. At least I know what IT is now. That should help me read it. I thought it was about a serial killer clown, and that was not at all appealing though I was 8 when I heard about the book. I loved IT when I was younger, but the movie scared the hell out of me when I was a little kid. It wasn't until I was in my teenage years that I read the book. A lot of Stephen King's stuff is influenced by H.P. Lovecraft, so he's got all manner of eldritch in his books. IT has always been the most obvious to me though, since it deals heavily with the idea of incomprehensible evil lurking on the frayed edges of normality. That's right out of Lovecraft's playbook! Glad I gave you some story fodder, Krystal! Thanks for stopping by.